Kathy Hester has already taught me so much with her first book, The Vegan Slow Cooker, and now she's taught me so much more with The Great Vegan Bean Book. I thought I had already posted a review of this awesome book when it first cam out but apparently I hadn't, so I am delighted and excited to share this review as well as give away a copy (just follow the prompts in the widget below to enter!) courtesy of the fine folks over at Fair Winds Press. Because they were kind enough to send the giveaway copy directly to me, I am able to do worldwide shipping, so this contest is open to readers worldwide! Did you know that you can make a pie crust out of beans? How about biscuits? And what would you say if I told you you could make fudgesicles out of beans? Wha-wha-what? Yep! Kathy has recipes for all of these, plus more than a hundred other innovative recipes featuring the magical fruit. 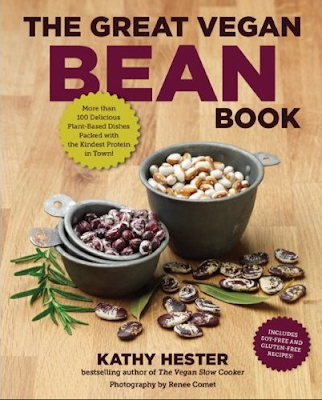 I will admit that I had my doubts when I heard Kathy was writing a book all about beans. I mean, how many different ways are there to make beans? Well, apparently, hundreds! And I was absolutely floored by the amazing ways she put them together. I mean just check out the Cherry Basil Crumble below. I have so many pages bookmarked in this book, that my husband told me he is worried about me eating too many beans (you know, the more you eat the more you...) but no worries, Kathy even has tips for using natural herbs to help you digest these beans more easily. Some of my favorites so far include the Hawaiian Sliders (page 96), The Pumpkin White Bean Chowder (page 75), and, of courde, The Cherry Basil Crumble Bars (page 182) below. It’s beans that allow the crust to be oil-free, but it’s the cherries and basil that make them extra special. Preheat the oven to 350˚F (180˚C, or gas mark 4). Oil an 11 x 8-inch (28 x 20 cm) casserole pan **or use a nonstick pan. To make the crust, add all the ingredients to a food processor and blend until the consistency of large cornmeal. Press into the bottom of the pan. To make the topping, add all the ingredients to the food processor bowl before you wash it and pulse until the almonds are broken up well. Pour into a bowl and set aside. To make the filling, you can still use the unwashed food processor and add all the ingredients. Double-check that all the cherry pits have been removed. You’ll hear them in the food processor if any slipped by. Spread the pureed filling over the crust and then crumble the topping over that. Bake, uncovered, for 20 to 30 minutes or until the topping browns and the filling has set up. Let cool and then cut into 12 bars. Try with different seasonal fruits and herbs or spices: apple cinnamon, blueberry mint, or even strawberry basil. My favorite way to eat bean is in salad with lots of veggie :) I also really enjoy eating a bowl of "bine" with a slice of bread in the morning. I love beans in soups and stews... a great way to get a filling meal with protein. I'm a big fan of homemade veggie burgers! I also like to mash chickpeas and mix with onions, garlic, ginger, chard, tamari and panko to stuff portobellos with! I love a chickpea salad. Mmm. HUMMUS. Black bean hummus, chickpea hummus, white bean hummus... 's all good. My favourite bean as of right now is garbanzo which i love in anything and everything esp salads.. I came up with an emergency quick/cheap recipe involving canned white beans, a bit of Earth Balance, nutritional yeast and Paul Prudhomme's Poultry Magic - it turned out to be one of my - and my omni spouse's - favorite go-to meals. I've been really looking forward to this book - everything I've seen from it looks amazing! I love bean salads, or just adding them to my green salads. i love making bean purees and then using that as a pizza topping! My favorite way to eat beans is typically straight up. I add beans to salads, soups and thrown on top of green veggies. One of my favorite, go-to dishes right now is a tex-mex or indian spiced black bean stew over a baked sweet potato. Totally delicious! I love chickpeas plain, in salads, burgers, hummus, black bean burgers, black bean dip. I've heard of beans in brownies, this books sounds like it has a ton of great bean ideas. I love beans in soup or as hummus! I am truly awful. I eat beans right from the cans sometimes! I drain them and dig in! I love beans in stews or hearty soups like minestrone. beans and rice, for sure! I think I eat beans every day! Bean burgers are probably my fave at the mo. I love all kinds of beans! I eat them every way they come from burgered to plain jane with rice! I've been hearing about this book! I love chickpeas as is. My girlfriend would love this book as well. I love Mexican bowls! With lime, coriander and cayenne...yum! I love beans. I can't choose my favourite way to eat them. Beans on toast for breakfast, chickpeas roasted with broccoli and garlic, hummus, red beans and rice. Vegan Explosion has an amazing frijoles negros recipe that I like to eat when I make her fideo recipe. I can totally understand how you could get an entire book out of bean recipes. Beans! I like them pureed into dips the best! chickpeas are a definite favourite. There is not much they can't be added too. I particularly like them mixed with oil and salt and roasted - my kids love it when they explode all over the oven too!!! The last few weeks I've been eating beans on top of salad for lunch. I mix them with some hot sauce and salsa, and it's just perfect. Vegan MoFo 2013: Just for Fun Friday! Vegan MoFo 2013: It's Crunch Time!